Goebbels was an early supporter of the Nazis, having developed nationalist and racist views before joining the Nazi Party in 1924. He became National Socialism’s main propagandist in 1929 as the party struggled to gain political ascendancy in Germany. Six weeks after becoming chancellor of Germany in January 1933, Hitler appointed Goebbels Reich Minister of Public Enlighten­ment and Prop­aganda (Volks­auf­klaerung und Propa­ganda), with a seat in the cabinet, a post he held continuously from 1933 until his suicide in 1945. One of his first acts in office was his book-burning campaign of books that did not correspond with Nazi ideology, the so-called “Action Against the Un-German Spirit.” The campaign culminated on the night of May 10, 1933, when university students and staff marched in torchlight parades and burned upwards of 25,000 volumes of “un-German” books, mostly authored by Jews and socialists, but also by Ernest Hemingway, Jack London, Helen Keller, and H.G. Wells. Goebbels possessed a doctorate from Heidelberg University, a flair for oratory (he was second only to Hitler in demand as a public speaker), and an appre­ciation for the growing importance of media, such as radio and film, theater, music, literature, and publishing. He naturally gravitated to the post of guardian of Nazi culture, estab­lishing the Reichs­kammer (Reich Chamber of Culture), which effectively controlled artistic life throughout the Third Reich but also promoted free concerts in factories, art exhibitions in small towns, and mobile movie theaters that brought the movies to every village. He authored a steady stream of Nazi posters and handbills and was editor of the Berlin Nazi news­paper Der Angriff (The Attack), first published on July 4, 1927. In 1939 the news­paper had a circulation of nearly 150,000 subscribers and by 1944 over 300,000. Goebbels was also a noted diarist and his diaries are important sources of information for historians of the Third Reich. Yet for all his importance as a chief figure in Nazi Germany (he was also party boss, or Gauleiter, of Berlin), Goebbels’ propaganda effectiveness waned after the outbreak of World War II. His attempts to maintain an air of German triumphalism on the home front after the disaster at Battle of Stalingrad (January 1943), followed by one military defeat after another, first on the Eastern Front, then the Western Front, were wearing thin with the public. To his credit Goebbels made use of every opportunity to galvanize the German people into defending their homeland, calling for total war, totaler Krieg. Over time he became the face and the voice of the dying regime. Unlike Hitler, safe in his various military headquarters and in the final months in his bunker in Berlin, Goebbels took his message directly to heavily bombed cities like Hamburg and Cologne. Hitler rewarded him by making him the hapless “Reich Plenipotentiary for Total War on the Home Front” in 1944 after Allied landings in France (Operation Overlord and Operation Dragoon) and Soviet successes in Belarus. 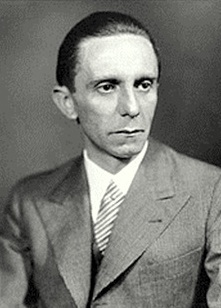 Goebbels remained the loyal Nazi to the bitter end, exhorting the German people that “miracle weapons” could still retrieve the military situation. In the final days of the Third Reich, he, his wife Magda, and their six children joined Hitler and his girlfriend Eva Braun in the bunker under the Berlin chancellery. On May 1, one day after Hitler and Braun had ended their life, Goebbels and his wife poisoned their children and then perished themselves. Like Hitler’s and Braun’s, their bodies were incinerated by loyal staff.